In 1945, after sportswriter Wendell Smith suggests that Brooklyn Dodgers owner Branch Rickey consider Jackie Robinson as the black ballplayer Rickey is looking for, Robinson and his team, the Kansas City Monarchs, stop by a gas station. When the attendant refuses Robinson entry to the washroom, Robinson says they will find another station at which to fill up the team bus, and the attendant relents. As Robinson steps out, a scout for the Dodgers sent by Rickey approaches him and invites him to Brooklyn. He is offered a $600 per month contract and a $3,500 signing bonus, which Robinson accepts after being warned by Rickey that he must control his temper if he wants to play. Robinson proposes to his girlfriend, Rachel, by phone and she accepts. During spring training, Robinson earns a roster spot with the Montreal Royals, the AAA affiliate of the Brooklyn farm system. After a great season there and spring training in Panama, he advances to the Dodgers. Most of the team soon signs a petition, stating they refuse to play with Robinson, but manager Leo Durocher insists Robinson will play with the main team. When Durocher is suspended by Happy Chandler, the Commissioner of Baseball, for actions in his personal life, leaving the Dodgers without a manager to start the regular season, Burt Shotton agrees to manage the team. In a game against the Philadelphia Phillies, manager Ben Chapman taunts Robinson, causing him to go back to the dugout and smash his bat out of frustration. With encouragement from Rickey, Robinson then returns to the field and hits a single, steals second base and advances to third on a throwing error, and scores the winning run. When Chapman's behavior toward Robinson generates bad press for the team, the Phillies' owner requires him to pose with Robinson for newspapers and magazine photos. Later, Robinson's teammate Pee Wee Reese comes to understand what kind of pressure Robinson is facing, and makes a public show of solidarity, standing with his arm around Robinson's shoulders before a hostile crowd at Crosley Field in Cincinnati, silencing them. In a game against the St. Louis Cardinals, Enos Slaughter "accidentally" spikes Robinson on the back of the leg with his cleats while running the bases. Robinson's home run against Pittsburgh Pirates pitcher Fritz Ostermueller, who had earlier hit him in the head, helps clinch the National League pennant for the Dodgers, sending them to the World Series, which they would lose to the New York Yankees. Gino Anthony Pesi as Joe Garagiola Sr.
Former minor league player Jasha Balcom served as a stuntman for Boseman in some of the film's scenes. Spike Lee planned to write and direct a film based on the life of Jackie Robinson and had it set up at Turner Pictures under his 40 Acres and a Mule Filmworks in 1995. The studio wanted to release it in 1997 to coincide with the 50th anniversary of Robinson's breaking of the color barrier, and courted Denzel Washington to star, but the project fell apart in 1996 over creative differences. In March 1997, Lee found favor with Columbia Pictures, who signed him to a three-year first-look deal. Columbia President Amy Pascal reflected that it would bring "enormous potential for Spike to reach audiences that are not traditionally associated with Spike Lee movies." The project eventually fell apart, but in 2004 Robert Redford set up a Jackie Robinson biopic as producer with Deep River Productions, as well as his own production company, Wildwood Productions. Redford also intended to co-star as Branch Rickey, and Howard Baldwin joined as producer the following year. In June 2011, it was announced that Legendary Pictures would develop and produce a Jackie Robinson biopic with Brian Helgeland on board to write and direct, under a distribution deal with Warner Bros. Legendary collaborated with Robinson's widow, Rachel Robinson, to ensure the authenticity of her husband's story. She had previously been involved with Redford's project. 42 was filmed primarily in Macon, Georgia, Birmingham, Alabama, and Chattanooga, Tennessee. Some interior scenes were shot at Atlanta Film Studios Paulding County in Hiram, Georgia. Most of the interior stadium shots were filmed at Engel Stadium in Chattanooga, Tennessee. Utilizing old photographs and stadium blueprints, Ebbets Field, Shibe Park, The Polo Grounds, Crosley Field, and Forbes Field were recreated for the film using digital imagery. 42 received generally positive reviews from critics. On Rotten Tomatoes, the film has a rating of 80%, based on 187 reviews, with an average rating of 6.9/10. The website's critical consensus reads, "42 is an earnest, inspirational, and respectfully told biography of an influential American sports icon, though it might be a little too safe and old-fashioned for some." On Metacritic, the film holds a score of 62 out of 100, based on 39 critics, indicating "generally favorable reviews". Richard Roeper stated, "This is a competent but mostly unexceptional film about a most extraordinary man." Lisa Kennedy, of the Denver Post, lauded the film, saying "This story inspires and entertains with a vital chapter in this nation's history." Conversely, Peter Rainer, of The Christian Science Monitor, criticized the film as "TV-movie-of-the-week dull and Robinson's ordeal is hammered home to the exclusion of virtually everything else in his life." The film's actors were generally praised, with Owen Gleiberman saying of Ford, "He gives an ingeniously stylized cartoon performance, his eyes atwinkle, his mouth a rubbery grin, his voice all wily Southern music, though with that growl of Fordian anger just beneath it." The Hollywood Reporter commented that Boseman "has the necessary appeal, proves convincing as an athlete and is expressive in spite of the fact that the man he's playing must mostly keep his true feelings bottled up." 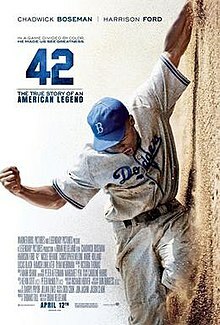 Jackie Robinson's widow, Rachel Robinson, was involved in the production of the film and has praised the end result, saying, "It was important to me because I wanted it to be an authentic piece. I wanted to get it right. I didn't want them to make him an angry black man or some stereotype, so it was important for me to be in there. ... I love the movie. I'm pleased with it. It's authentic and it's also very powerful." The film earned $27.3 million for its opening weekend, the best premiere for a baseball-themed film in Hollywood history. Only released in the US and Canada, the film went on to gross a total of $95,020,213. 42 was released on DVD and Blu-ray on July 16, 2013 in the United States and on February 3, 2014 in the U.K.
Robinson and Rachel Isum became engaged in 1943, while he was still in the United States Army and before he began his professional baseball career, unlike in the film where he proposes after signing the contract with the Dodgers. The scene of Robinson breaking his bat in the dugout tunnel is not based in fact. Both Rachel Robinson and Ralph Branca, film consultant and Dodger pitcher in the dugout that day, say it did not happen. Director Helgeland concurs, explaining that his justification for including the scene was that he felt "there was no way Robinson could have withstood all that abuse without cracking at least once, even if it was in private." Red Barber would not have broadcast Dodger away games from the opposing team's ballpark in Philadelphia and Cincinnati, as shown in the film. Radio broadcasts of away games in this era were recreated back at the studio from a pitch by pitch summary transmitted over telegraph wire from the stadium where the game was being played. Wendell Smith is said to have been the first black member of the Baseball Writers Association of America; Sam Lacy was the first, having joined in 1948. Pirates pitcher Fritz Ostermueller threw left-handed, not right-handed as in the film. His first inning pitch hit Robinson on the left wrist, not his head, and he claimed it was a routine brushback pitch without racist intent. There was no fight on the mound afterwards. The climactic scene in which Robinson hit a home run to clinch the National League pennant for the Dodgers came in the top of the fourth inning of the game, did not clinch the victory (it made the score 1–0, and the Dodgers eventually won 4–2), and did not clinch the pennant; the Dodgers clinched at least a tie for the pennant on that day before clinching the pennant the next day. ^ "42 (12A)". British Board of Film Classification. July 8, 2013. Archived from the original on July 13, 2013. Retrieved July 9, 2013. ^ a b "42 (2013)". Box Office Mojo. 2013-04-03. Retrieved 2013-07-27. ^ Fordin, Spencer (December 9, 2011) Jackie Robinson movie to star Ford, Boseman. Mlb.mlb.com. Retrieved on April 23, 2013. ^ Chandler, Rick (December 21, 2011) Harrison Ford to play Branch Rickey in movie about Jackie Robinson. Offthebench.nbcsports.com. Retrieved on April 23, 2013. ^ Neuse, Corwin (May 22, 2012) Lucas Black Is Pee-Wee Reese In '42' Archived July 30, 2013, at the Wayback Machine. Social.entertainment.msn.com. Retrieved on April 23, 2013. ^ Calcaterra, Craig (June 4, 2012) The Jackie Robinson movie “42″ to open next April 15. Hardballtalk.nbcsports.com. Retrieved on April 23, 2013. ^ Kepner, Tyler. "Immersing Himself to Play a Pioneer". New York Times. Retrieved April 16, 2013. ^ Cox, Dan (October 16, 1995). "Turner Pix bows starry slate". Variety. Retrieved October 17, 2014. ^ Cox, Dan (March 2, 1997). "40 Acres & A Mule to Col". Variety. Retrieved October 14, 2014. ^ McNary, Dave (July 5, 2004). "Duo in Deep with Par". Variety. Retrieved October 17, 2014. ^ McNary, Dave (June 20, 2005). "Rodney gets some respect". Variety. Retrieved October 17, 2014. ^ McNary, Dave (June 1, 2011). "Jackie Robinson biopic takes flight". Variety. Retrieved October 17, 2014. ^ McAllister, Cameron (April 22, 2013). "Review: "42"". Reel Georgia. ^ Fine, Marshall (7 Apr 2013). "Film wizard Richard Hoover turns Chattanooga's Engel Stadium into Brooklyn's Ebbets Field in 42". New York Daily News. Mortimer Zuckerman. Retrieved 21 July 2013. ^ "42 (2013)". Rotten Tomatoes. Fandango Media. Retrieved June 22, 2018. ^ "42 Reviews". Metacritic. CBS Interactive. Retrieved June 22, 2018. ^ Roeper, Richard (April 12, 2013). 42 Review. Richard Roeper & the Movies. Retrieved April 16, 2013. ^ Kennedy, Lisa (April 12, 2013). Movie review: "42" gives baseball great Jackie Robinson, but also heroism, its due. Denver Post. Retrieved April 16, 2013. ^ Korsgaard, Sean CW (April 12, 2013). 42. Korsgaard's Commentary. Retrieved April 16, 2013. ^ Rainer, Peter (April 12, 2013). '42' is a dull treatment of Jackie Robinson's story. Christian Science Monitor. Retrieved April 16, 2013. ^ Gleiberman, Owen (April 29, 2013). . Entertainment Weekly. ^ McCarthy, Tom (April 9, 2013). The Hollywood Reporter. ^ Haylock, Rahshaun. "Rachel Robinson reflects on role in making '42'". FOX Sports Interactive Media. Retrieved 17 May 2013. ^ Smith, Grady (April 14, 2013). "Box office report: '42' knocks it out of the park with $27.3 million; 'Oblivion' huge overseas". Entertainment Weekly. Retrieved April 14, 2013. ^ Robinson, Jackie (1995) . I Never Had It Made. New York: HarperCollins. p. 13. ISBN 0-06-055597-1. ^ Koltnow, Barry (April 19, 2013). "Viewpoint: Why biopics swing hard and strike out". The Providence Journal. Providence, Rhode Island. p. C3. ^ "Transcripts: Show". PRX. Retrieved May 4, 2013. ^ Williams, Jim; Staff (August 5, 1921). "Baseball Games Re-created in Radio Studios". Modestoradiomuseum.org. Retrieved May 4, 2013. ^ Litsky, Frank (May 12, 2003). "Sam Lacy, 99; Fought Racism as Sportswriter". The New York Times. Retrieved January 14, 2011. ^ Kennedy, Wally (May 5, 2013). "'It didn't happen that way'; Daughter of pitcher in '42' says movie unfair to her father". The Joplin Globe. Joplin, MO: Community Newspaper Holdings. Retrieved May 6, 2013. ^ "MLB Stats, Standings, Scores, History". Baseball-Reference.com. Retrieved May 4, 2013.